We reorganized yesterday. It took several hours to move all the canning jars from the basement to the garage in preparation for painters. Moving all those jars was definitely confronting. 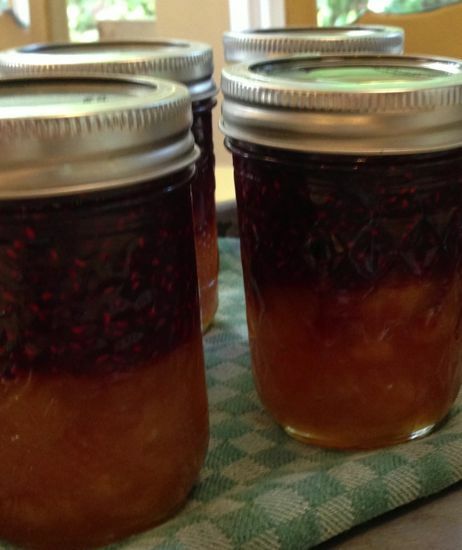 There has been a lot of canning going on as I test and test and retest every recipe for the book. But I’m not here to talk about recipes or testing. I have a bigger problem. 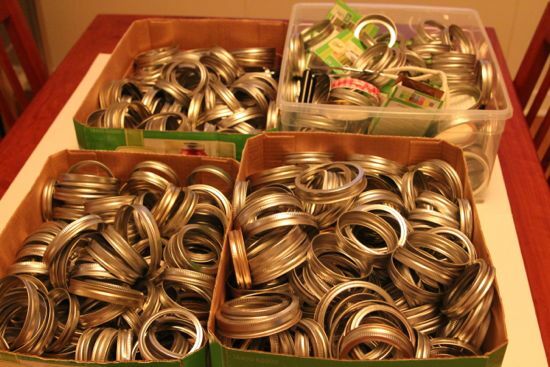 Canning rings are taking over my house. There must be eight or nine hundred rings lurking in four boxes. I’m willing to trade jams, jellies, sauces and more for just one clever idea. Every canning safety site tells us to store jars in a cool, dark space WITHOUT THE RINGS. The idea is a simple one. If something goes wrong, if there are micro-organisms lurking in your preserved foods and the food goes bad, the seal will break and the lid will lift off the jar. If the ring is in place, the lid can not lift off and you may not know the food has gone off. Or the jar might explode. Yes, explode. Trust me, if you have ever had a dozen jars of pickles break (and disgorge their briny vinegar all over the basement floor), you know what I mean. That was a bad day. Now, I’m very careful and remove the rings before storing the jars. The rings go into a box and are reused when the jars are reused. How is it I have ended up with all these extra rings? And is there a home for wayward rings? A place to send the extras? A crafting project that needs to happen? One of you has an idea, I’m sure of it. Send your best ideas for what to do with all these rings or how to store them or just grouse along with me about the proliferation of metal rings. I’ll send whoever has the best idea a big box of goodies from my pantry. This is a totally subjective giveaway! If you’ve won before, you can’t win again, but please contribute ideas anyway. And because subjective judging is annoying, I’ll do a random giveaway, too. Two Giveaways! Two boxes of YUM. One for a great idea and one simply for visiting my site. The rings are TAKING OVER AND THEY MUST BE STOPPED. PS I love the look of this layered peach and raspberry jam. Pretty, right? I’ll include one of these jars in the giveaway. I hang mine (divided by size) on bungee cords that are looped and hanging from the shelves that hold empty jars. Easy to grab one end and take what I need, and takes up very little usable space. I’m so glad you posted this! I too have boxes of rings AND used lids sitting around because it seems a shame to toss them. Use them to bake perfectly shaped, thick cookies, a la Beurre & Sel. I’ll trade you – I have rusted rings every year that I have to discard. How do you keep them going??? For so long???? My suggestion is to donate them to a preschool (or elementary school) to make kids ornaments. Take a child’s school picture and cut to fit inside the ring; glue a ribbon around the ring and add a bow and loop to the ribbon. Voila! A great memento! and here is a gathering of all various idea on pinterest!! There are SO many great ideas!!!! I hang mine on wire coat hangers, you can twist a few together to create more space and there is a built in hanger! I saw an idea go by on Pinterest recently, and it was to tie the rings together in a circle and make a wreath out of them. You could add pretty seasonal ribbon to it if you wanted. I have so many stinking rings too. Currently I have them on wire coat hangers for regular mouth and wide mouth. But I had an idea to make 4 season wreaths with them for my mom and a few friends for Christmas. My mom always puts something seasonal up for decor, and I thought what a good idea to make a summer canning wreath, autumn, Christmas/winter, and spring – hit up AC Moore or Michaels for some fake seasonal arrangement things that can be hot glued on the ring wreath with appropriate ribbon. Voila! Easy gift. And I’m not even that crafty of a person! Also, I try to remember to put a ring on a jar when I give them away, because it looks more “put together.” I tell people they can toss them with the lid when they are done, just save the jar for me. You could also make a pin cushion for sewing with them. Use a piece of fabric wrapped around stuffing inside and push it through the hole of the ring so that the nicer outer side of the ring shows a bulbous, tight fabric-wrapped bulge. Use an old used lid to push through the bottom to keep the fabric and stuffing inside the ring, hot glue in place. The bulge of fabric wrapped stuffing should be tight and gently rounded coming out of the hole of the ring, nothing sticking out ridiculously. You should still be able to screw the lid on a jar most of the way. Use any unused quarter pint, half pint, or pint jars to make a sewing kit and put the items in the jar, using the pin cushion lid as the top. Now see, this is why I make a lousy canner, I always leave the rings on. Well, not an idea for the rings, but when was a girl scout leader, we did a project where the kids decorated the rings with glitter and such and added some sort of hanger (think yarn, ribbon, etc.). Then they glued their pictures onto the lids, then glued the picture/lids to the rings, making ornaments for the Christmas tree. I still have the ones my kids did. I forgot to say: the jar sewing kits with pin cushion lids would make great gifts, especially in a gift basket for a bridal shower or wedding. Everyone should know how to do simple hand stitching when needed. I was so proud of myself — was going to tell you to drop them off at a few local pre-schools so the kids could use them for art projects — but Linda beat me to the punch. One other idea, also in the “crafts” category — make pin cushions out of them. Someone must have a two-or-three step set of directions for using fabric remnants and the rings — perfect for kids learning to sew. they could also be used for wreaths! I’ve been storing them in wooden Clementine crates, as I can stack those and stack them in storage. Easy to move too, as the crates stack nicely in a reusable grocery bag if needed. Helps that I have a bunch of them. All about the justification! No good ideas here, but a lot of empathy! It’s amazing how fast those darn rings accumulate! You should use them for needlepoint or cross-stitch hoops! I have a vision of little decorative hats for all of your jars…not that receiving a wonderful, homemade jar of anything isn’t wonderful, but it would make it more festive! But if I ever have too many, I am totally going to store them on bungee cords on my racks – thought that was a great idea! The gold colored ones would look really cool glued on an accent wall–one painted robin’s egg blue for example. It would be like amazingly 3D retro wallpaper. Your posters inspired me to this idea: Use one of those slacks hangers with multiple rows of swing-out bars. Organize large and small rings by row – then slide out whatever you need from a closet. Why didn’t this occur to me earlier?! I had a lot of rings I recently gave away because I was moving to Italy. My suggestion is just to give some of them away to friends who enjoy canning! I take them off, wash the jars off and the rings and then LOOSELY put them back on. Keeps them from rusting and definitely keeps them from cluttering up the cupboards and drawers. However, that does not explain the two grocery bags full lurking in the jelly cupboard. Maybe you could donate some of them to an elementary school so the children can make art projects out of them? I’m sure there are creative things that they’d love to do with them! My husband made me a ring holder by taking a square board (about 1 foot square) and putting 9 dowels about 1 foot tall into it. I stack the rings on the dowels (kind of like those kids ring stacking toys). I can hold more than a hundred rings on it. I have a couple of boxes of rings in the basement also. In the past I have donated extras. I have very little extra storage so I do the same as Joanne. After washing and drying my filled jars, I replace the lids very loosely on the jar so there would be no interference if the seal should fail. Works really well for me. You know I am not a canner, but am the lucky recipient of many delicious home preserved goodies. I take the rings and wear them as bracelets. I’ve also fashioned necklaces and earrings, as big heavy chains are so chic! Haven’t read any other ideas so I apologize if I’m redundant. One idea is re storing and what comes to mind are poles that you just slip the rings onto. They could be coming out from a wall or up from the floor (seems less space-saving) and I envision them about 2″ in diameter and perhaps painted fun colors. My other idea could be used either way, because you definitely do not need ALL the rings you have ;o), and that’s to get ahold of someone at Etsy whose crafts seems as though they would utilize rings. Reuse, recycle! My mantra. Good luck, Cathy! I use a paper towel holder as kind of a standing pole to stack mine on. Me thinks you might need an industrial size for that many rings! I’ve used the lids and tops to make candles. Ideally the top should be a one piece top but I’ve ignored that for a long time by just gluing the two together with some Gorilla glue. I save old candles, melt them, pour the wax into the lid/ring and add a wick. They’re great outdoors in masses…which it sounds like you could do! Who has time? Dump almost all of them and walk away. You will thank me later. We use them for FireFly jar lids. Just cut a piece of screen to fit in the ring, glue it in (if necessary – we’ve been lucky and cut the screen slightly oversized and it just wedged in with no glue), and you have an instant bug jar. We used ours for fireflies a few nights back. And… we discovered that fireflies like to climb up, so we would turn the jar upside down before opening, and all the fireflies would climb to the ‘top’ while we opened the ‘bottom’ and added a few more! Just remember to let the fireflies go pretty quickly. They don’t like to be kept in a jar for very long. I just keep mine in gallon Ziploc bags to keep them clean, and toss them inside my big canning pot until the next time I need them. The bags keep the dust and dirt off of them in my basement, and prevents rust from forming. Storing them in my pot uses the empty space. I would probably mount some rods on the wall, and hang them…at least they would be out of the way and look neater that way? Put them in your blue recycle container and try and walk away, not thinking about them again. They’ve had a good life and now they’ll be something else like a bolt or whatever they make out of recycled metal. Or ask Dennis to do it and not to mention it again. If you don’t they’ll stage a coup d’état and you’ll be enslaved forever…. Recycle! I hang mine to save shelf space but still…they multiply! They should sell jars without rings! I try to only buy jars at thrift stores without rings. I liked the idea of just dumping them and walking away, even if that sort of thing can make me shudder. Throw something away!?! My idea: send them to all those friends who have joyfully received your homemade goodies and yet somehow neglected to return your jars. Spray the inside of the rings with cooking spray. Put the rings rightside up on a hot griddle or in a hot skillet and crack an egg into each one. This way, the eggs will cook in nice, neat circles. I make herbal honey in quart jars, using used rings, since there is no sealing involved. Instead the honey rests in the jars for at least a couple weeks before being bottled in honey jars. I would be happy for any leftovers, since mine are starting to look very used. I use lots of mason jars with rings and lids in the kitchen to store pantry items (flours, grains, beans, etc.) as well as leftovers in the fridge and freezer, so I never seem to have an abundance of rings. funky junk has a cool wreath made from rings. i use several for cooking eggs too, and keep them for just that. i also have heard you can tie them together to make trivets or to put into pot of different sizes to keep jars off bottome when you are making small batches of jam etc, i have four different sizes because they don’t make trivets to the right size for my pots. i also have squillions(?) of rings from the years. when i give gifts, i include at least 1 of the right size to fit jars of jam so the recipient can keep safely in fridge. good luck with your delimma. i just keep them in mesh produce bags by size and hang then from my metal shelves. Buy some pretty ribbons from the scrap bin in a fabric store and string on the rings. Fasten each end to either side of the shelve racks to make canning garlands! 2. Rig up some sort of storage with dowels- like a ring-toss game! Hang some dowels on the wall in the garage? Make a ring toss game! A couple pieces of wood and some dowels… voila! Or, place the rings on the ground and try to toss something into them (pennies, rocks, etc.). For both ideas the rings could be painted different colors and the different colors are worth different point amounts. I’m very much a canning novice, but what’s wrong with just putting the rings back on the jars very loosely? Won’t the lid tell you whether the jar is sealed, ring or no (by being popped or not)? First, thanks for the reminder ;-). I see many vineyards hang things around to scare birds away. I wonder if they could string rings? Or tie them periodically throughout a vineyard? I remember my mom’s “wreaths” of rings tied together with twine and hung from nails on the floor joists, visible in the unfinished part of the basement next to the furnace and the ‘hide the body’ chest freezer. Ah, the memories–Pinterest’s got nothin’ on that! Your shelves of canned goods look so wonderfully inspiring to me. 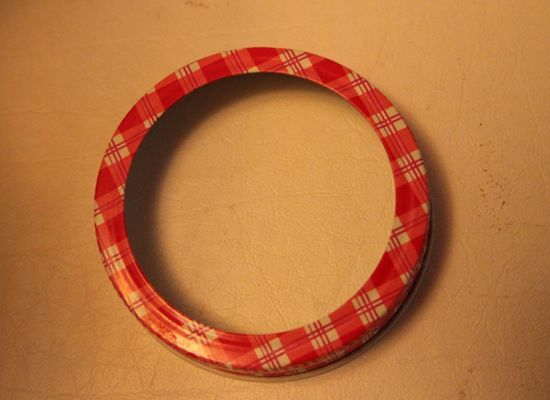 Well my day job first had me thinking just what Gail already suggested — canning ring jewelry! Big hoop earrings, bangles, big necklaces, etc. Next thought: hot glue some together to make fun trivets. First X amount of people to buy your book will get a trivet! Another thought: Donate them to Project Runway for a “Farm-to-Table-meets-Homemade-Pantry” design challenge! I can just see a fabulous skirt made of a red checkered picnic table cloth with stacks of canning rings bouncing underneath…. I agree with other posters who have said use them for bracelets. Perhaps paint first and add a bit of bling to them. They make great sounds when rustled together! Which leads to another mentioned use. Create a windchime out of them, perhaps interspersed with old silver spoons and forks to create interest in both sound and shape. All could be connected with cord/wires through the holes of an old collandar. My best memory of the use of a canning ring is visiting my parents’ home. 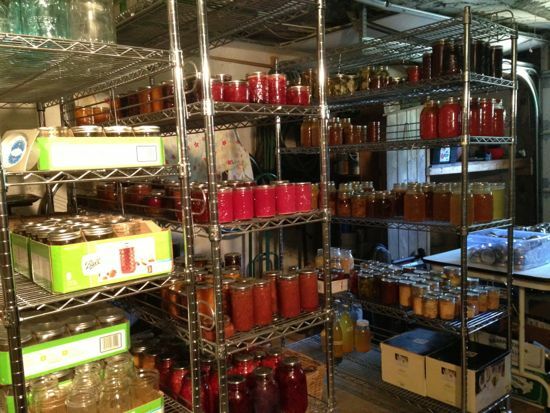 They have a “fruit room” under the stairs where they keep their canning. The light switch is a long cord attached to the light fixture in the ceiling. Years ago they tied a cannng ring to the end of the cord so it is easy to find and pull. I have the opposite problem! A friend and I canned a few pecks of peaches this weekend and I was struggling to come up with enough narrow mouth rings. I have a lifetime supply of metal lids and tattler lids…but. Now I have several jars in my fridge ring-less. Why don’t they sell jars with or without rings so you could just get jars if you have an abundance of rings? I like the pin cushion idea, especially using the red plaid rings. Using the same idea, you could create sachets by pushing lightweight fabric or netting through the ring, filling with potpourrie and gluing a used lid on the bottom. Glue a ribbon around the sides to pretty it up. I’ve often wondered why you can’t buy jars without the rings/lids. I have no idea what to do with them, although my great granddaughter liked to play with them when she was a baby. I did try hanging them in the apricot tree one year, but our squirrels/birds/raccoons wise up very quickly and nothing deters them for long. I got tired of buying new rings every season due to losses along the way when this very simple though struck me. The retaining ring doesn’t have to be completely removed. I simply loosen the ring to the last thread and keep the ring on the jar. The gap between the top of the ring and the seal has been good enough to handle the solids and (most of the liquids) when I’ve had sterlization failures. So, what to do with the rings? Nothing (kinda). Too funny, I have the opposite problem, I want all those rings and will buy from you! Send me an email with your quantity and price + shipping and we’ll see what we can work out 🙂 My email is angi.lee@verizon.net Thanks! Maybe you could donate them to a local food swap group? Sometimes they organized DIY events, and might have a canning event they could use them for, or else just put them out in a bucket at the next food swap offering them to people to take as they need? I love the idea of using them to poach eggs – and of course I use them in the bottom of pots as makeshift canning racks, since I never bought a “proper” canning set up. http://pinterest.com/pin/97460779409102444/ cute canning jar lid pumpkins! I’m making a stuffed minion doll and using the rings for his goggles. My daughter also likes to use them as music maker-like a maraca. Put a few on a string, tie the ends together and shake a way. And, use them to hold tea lite candles. Paint them any color you like, save the used lids and wash and dry those, glue them together and add a small candle. I just have to say….I WANT a basement! Jealous of your shelves and space, the joys of living in a small cottage in Southern California. If you like being crafty, I’ve seen this on Pinterest. Spray paint the rings orange, then tie them together forming a round shape like a pumpkin. Glue a couple of cinnamon sticks in the center for the stem. I do a lot of canning, however, I always leave the rings on the jars. Just the way we’ve always done as a child growing up. Although, I’ve heard many remove them. I still end up with lots of extra rings, so I’m going to make a few of these pumpkins. I enjoyed reading all the replies, nice site. Dontate them to a local school. Believe it or not they ask for things like this for counting games, crafts, maybe even a ring toss game. I know several people that save milk jug caps to donate for this purpose. Also it will save you the trouble of figuring out exactly how to use them. Believe me teachers have to be creative these days and I am certain they would appreciate the donation and come up with a use! I’m late to this party, but wanted to chime in. Our local food bank’s Garden Project has canning supplies for folks who want to preserve stuff from their gardens and are always looking for donations. We also have programs through our local extension service that do canning workshops and 4-H programs do the same. I also have a box or three full of rings that I dig thru on a regular basis. I’ve been tempted to turn their jangling mess into ‘wind chime scarecrows’ to use in the garden. Good Luck finding a home for your stash! I too was thinking poles to put them on, loops to hang them on, pincushions and tiny Christmastree ornaments fixed into them. But my guess is, you gave away jars of goodies, but kept the rings, because they should not be left on. In future, do give away filled cans, but include the ring, neatly packed away in an envelope/couvert, close that firmly, but before filling it, write upon it somethung like: this ring belongs to the jar, but should not be put on it, before it is empty. See my blog.. once you have given away the surplus rings, you will not start another surplus this way..
Hi, I know this is way too late but here is what I do..I check the jars for proper seals, generally wash the jars to remove any residue, put clean, dry rings on very loosely and put on the storage shelves. Then I wash the rings and put them on baking sheets in the oven @ 175′ to dry. I store all my empty jars with a ring on. I do have a 5 gallon bucket of both regular and wide lids. ps. I have the same type storage shelves and love them! Hi, I keep my rings on belt hanger loops. One for regular and one for wide. They live inside an enamel water bath (that is only used for this storage). Inside the hoops/rings are a pint freezer box with seals (one regular one wide) ready to grab. It keeps everything pretty organized. I get rid of rusty rings in the trash. I could have been in your shoes except for the epiphany that I only ever need enough rings for a days worth of canning at one time so it is okay to not have the huge excess hanging around. I’d bargain with the gal that needs them and ship them on their way to a good home. I want some of those rings!!! I saw the pumpkin on Pinterest and want to make one, but I don’t can. I don’t care if they are scratched, rusty, a little dented… I’d like to make a rustic looking pumpkin. If you still have some to unload, please email me and I’ll pay for you to ship me some. I don’t want to buy new ones, they just won’t have the same character. I too saw the neat pumpkin made from jar rings and trying to get a supply-enough to make “pumpkins” for our October Woman’s Fellowship luncheon for table decorations! Has anyone ever tried to spray paint the rusty rings? I have some that just have minimal rust on them and I want to use them for mason jars for party favors? I too had boxes of rings and saw the pumpkin idea. I’ve made several, some sprayed orange and some left to show the “vintage”rusty look people tend to like. Now I need more rings! It’s a super fun project. I’m interested in buying your old rings if you’d like to get rid of them.